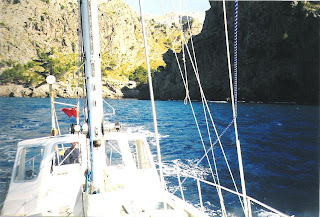 On the morning of Thursday, 11th June, we steered the yacht directly into a thirty knot wind, while heading out to sea through the narrow entrance of Cala de Fornells. The approaching waves with breaking crests looked grand. As soon as we were through the entrance we partially unfurled both the Genoa and main. ‘Secant’ took the seas in her stride, never giving us cause for concern. 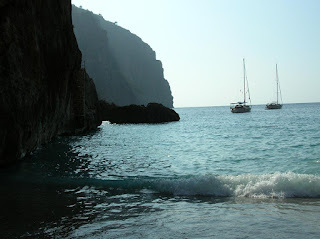 When outside in open water, and clear of the cliffs, we eased sheets. That had us romping along in fine style. To leeward and stretching ahead as far as we could see, there were fantastic craggy cliffs, and behind them was a backdrop of wooded hills. Dark clouds dramatized the effect by adding to the stormy scene. Soon Menorca was just a grey smudge on the horizon. We were bound for Mallorca, and before nightfall we arrived at Puerto Alcuidia, after having experienced a day of exhilarating sailing. Yet again, what a pain the anchor proved to be! We could not make it hold, and after numerous attempts, we were forced to enter Alcuidia Marina where millionaires moor their yachts. The strong wind made coming alongside tricky, but we were fortunate by finding a vacant spot by the lifeboat. This meant we did not have to moor head-on to the quay with lines astern, as is usual in the Mediterranean. By the morning of Friday, 12th June, the wind had died down somewhat, and the sun shone brightly. We needed to make a visit to the supermarket, and I wanted to get my hands on some cash. Therefore we went together to explore the resort, but on the way we stopped for a beer - which turned out to be a very large one - so large that I could not drink all of mine. Gordon downed his with ease. After relaxing with our cooling drinks, we continued searching for our objectives. The supermarket was easy to find, but a bank with a cash dispenser was elusive. When I was about to insert my card into the dispenser I experienced a sudden loss of confidence. I was convinced it would be swallowed up, and gone forever! I asked Gordon to stand by, as I went through the process of selecting English, before proceeding. At that point my confidence returned, and I had no further difficulty. I remembered it was my wife's birthday, and that she was intending to have a party with our daughters. I therefore I phoned her by using my phone charge-card. All was well. When we returned to the yacht, Gordon made use of the Marina’s facilities. He hosed ‘Secant’ with fresh water, and replaced her ineffective Bruce anchor with a standard Danforth. 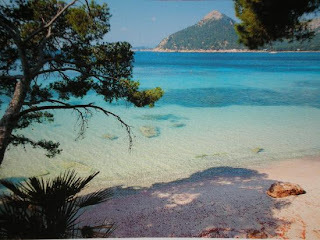 Afterwards we sailed to Cala Formentor, where we saw the British registered yacht ‘Scot-free'. She was flying the Saltire from her port shroud. A short while after our arrival she moved to the other side of the bay. Not long afterwards, a jetski that had been zooming around ‘Secant’ ceased its noisy gyrations, and we were left in peace to enjoy a lovely sunset. We had a quiet night, which enabled us to sleep soundly. Our lives had become nomadic. Seldom did we stay in any place more than a couple of days. Gordon was not at all superstitious, and neither was I; therefore we never feared sailing on a Friday. 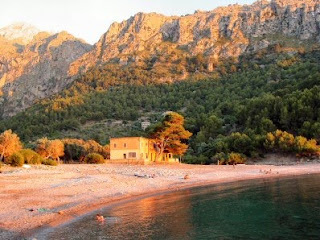 Neither did the thirteenth day of the month have any significance; so we sailed on Saturday, 13th June, to explore the north coast of Mallorca. As we expected, the wind was almost from dead ahead and it became blustery, so that spray flew over the doghouse, encrusting it with salt. By motor-sailing we were able to maintain a speed of five knots, which was necessary for satisfactory progress. What made this part of the trip memorable was the superlative cliff scenery. Inland beyond the high cliffs there were spectacular mountains on a grand scale. 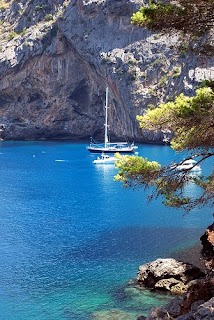 We entered two calas before Soller which we chose as the most secure anchorage for the night. 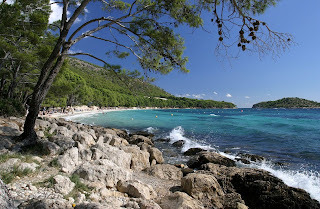 It was the first real haven we found with any shelter, but even there, we heard that two yachts had been washed up on the beach only days before by strong winds. 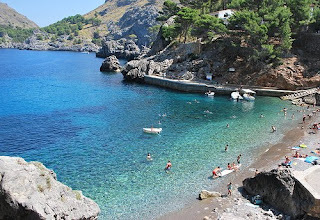 The first cala we came to was Calobra, but for some unaccountable reason I became quite scared when going in. At first, all we could see was what appeared to be a tiny building at water level. This was at the foot of cliffs that towered overhead. It seemed impossible there could be room for a yacht to anchor there, but our GPS confirmed our position and we continued. Closer-in we found huge perpendicular cliffs on either side, and ahead there was a tiny pebbly beach with a few small buildings. We took continuous soundings. The scenery was fabulous. There was a backdrop of fairy-tale mountains beyond a narrow valley. I became aware of the sound of lapping water that was caused by waves bouncing from the base of the cliffs on either side. Rather strangely I could also hear birdsong echoing around the rock basin. I observed that a handful of people who were sat on the beach were showing an interest in our movements. One of them had a pair of binoculars trained on us. When the anchor was down, ruffles of wind from all quarters constantly turned the yacht according to its whims. I felt distinctly uneasy, and made an effort to qualm my fears, but in the end I expressed my feelings to the skipper, who decided to break out the anchor and sail for the next cala, by the name of Tuent. There we dropped the hook rather too close to the beach, which gave us only a metre under the keel. If the wind were to increase, there would be little room for manoeuvre. 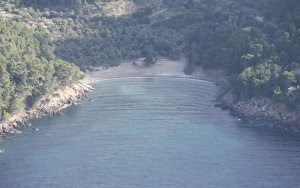 Once again, discretion was the better part of valour, and we motored for the security of Soller.